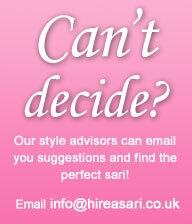 Hire A Sari is the very first Asian Hire Service to be launched in the UK. Our exclusive and easy to use website allows women to order fashionable saris online accessible via P.C’s, tablets and mobile phones. Wheather your attending a glamourous Asian Wedding, Bollywood Themed Party or a Prom, Hire A Sari offers a selection of sari's designed with influences from the East and West and suitable for all occasions. Allowing women to never be seen in the same outfit twice, A Hassle free service at a fraction of the price of buying. Simply browse our online collection and add your chosen sari into your shopping bag. The sari will be delivered straight to your door. Keep the sari for a 7 Day hire period and once you have finished just pop it into the returns bag provided and send it back. Hire A Sari sends you everything you need for your special event including a blouse, petticoat, instructions on ‘How to Wear a Sari’ and even a FREE matching bindi with every order. If you can't decide which sari to choose from the online collection contact one of our style advisers, they are always happy to help and can recommend colours and styles to suit all body shapes and events.